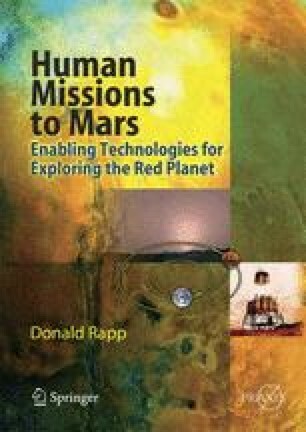 As we have seen in Chapter 3, the problems involved in launching, transporting, landing, and returning large masses from Mars present formidable challenges. However, other challenges exist in sending humans to Mars. These include life support (consumables and recycling), mitigation of radiation, and low-gravity effects, providing abort options, utilization of indigenous planetary resources, as well as human factors. Scientific American, March, 2000; Addendum II: Mars Direct—A Practical Low-Cost Approach to Near-Term Piloted Mars Missions, http://www.iaanet.org/p_papers/add2.html; and Mars Direct: A Simple, Robust, and Cost Effective Architecture for the Space Exploration Initiative, Robert M. Zubrin, David A. Baker and Owen Gwynne, AIAA-91-0328.